The best way to explore the elegance of Morocco’s desert culture? 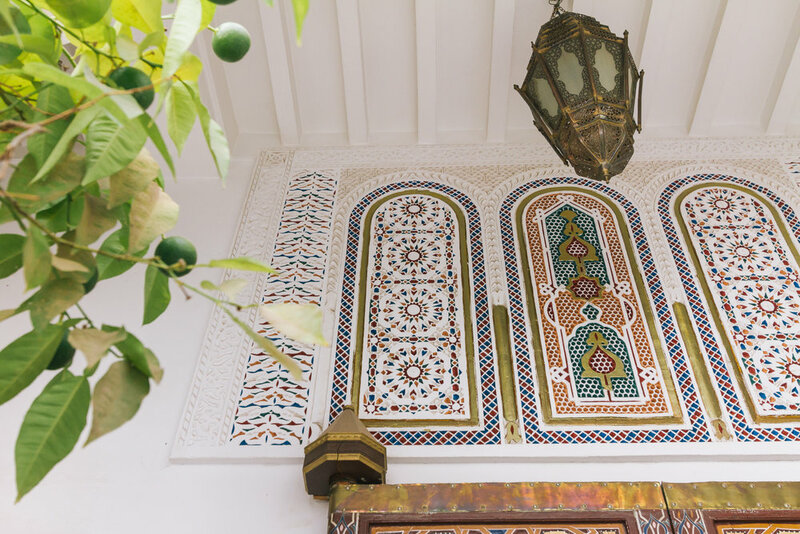 We suggest spending a few nights in a Riad - a traditional Moroccan home with an enclosed garden or courtyard. There is nothing you can’t find in Marrakech, the cultural and economic centre of Morocco and home to some of the country’s most charming riads. Our short stay at the Medina, an old quarter of Marrakesh, was highlighted by a night’s stay at the historically charming Esprit du Maroc - a restored 18th-century traditional Moroccan palace renovated to house five guest rooms, two courtyards, a plunge pool, a restaurant, rooftop terrace and a wellness centre for massages and traditional Hammam. There is no shortage of beautiful riads in Marrakesh. In fact, the intertwining labyrinth of Marrakech’s old Medina is ladened with riad-style guesthouses all pledging to provide guests with an authentic Moroccan experience. After much research, we settled with Esprit du Maroc for their pristine tile work and hand-finished details throughout the property that preserves the art of a centuries old tradition. Central enclosed courtyard with a plunge pool at Esprit du Maroc. Hand-carved details from the 18th-century are still crystal clear. Upon entry, we were welcomed by colourful hand-laid tiles or Zellige, a form of Islamic art which consists of individually chiseled geometric tiles set into a plaster base to create dynamic patterns. After being introduced to Morocco at 711 A.D., Zellige quickly became a symbol of sophistication and wealth in Moroccan homes and is a defining characteristic of Moroccan architecture. We were told that the amount of Zellige in a home reflects the status and wealth of the family who resides in them. We were not surprised when we discovered that the property was the former residence of a politically significant family back in the day. Intricate Zellige art on a outdoor fountain in the courtyard of Esprit du Maroc. The riad is designed in a way that allows almost every room on the property to open up to the elegant plunge pool in the central courtyard. Outdoor lounging areas can be found throughout the property, inviting guests to relax with a book or a session of hookah after taking a dip in the pool. The enclosed courtyard offers plenty of privacy, shielding guests from the bustling medina just outside the walls. This style of housing, lacking an exposed outdoor garden, was believed to have originated from the Islamic beliefs to protect the privacy of women whilst in residential gardens. The tall walls also play an instrumental role in shielding the garden from the region’s glaring sunlight, keeping the residence cool throughout the day. Looking out from the restaurant entrance. The elegant restaurant inside the hotel serves an A la carte menu to hotel guests. Classic European and traditional Moroccan decor meld together harmoniously in the dimly-lit setting for a romantic and intimate dining experience. Even though we didn’t have the opportunity to dine at the restaurant, we were mesmerized by the meticulous details throughout. Esprit du Maroc’s A la carte restaurant. The superior bedroom we stayed in opens up to a balcony view of the central courtyard through large French doors with arched transom. Intricate hand-finished details extend into the bedroom where hand-painted ceiling motifs transfixes your attention. On the other side of the room, a cozy seating area with arm chairs and a fireplace offers guests a place to relax over a pot of tea. 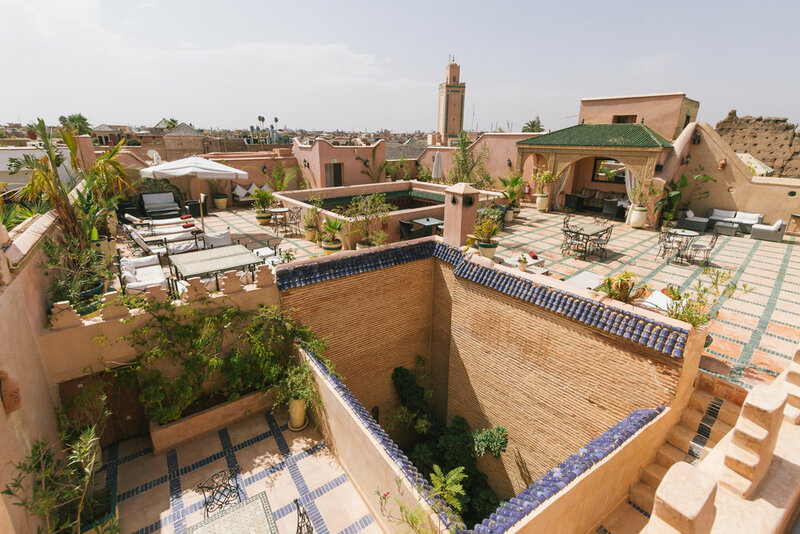 If there is one thing we regret from our stay at Esprit du Maroc, it is wishing we had spent more time on the hotel’s rooftop terrace with a panoramic view of the surrounding medina. Ample chairs and loungers spread throughout the large terrace, letting sun-loving guests bask in the Moroccan sun. If the temperature gets too high, the plunge pool is only a couple flights of stairs away where you can easily cool down and start all over again. Large rooftop terrace at Esprit du Maroc. (Left) Intricate patterns of a chest inside the guest room. (Right) Tile work on a Moroccan fountain inside the small courtyard. If you are ever to travel to Morocco, don’t forget to book yourself a stay at a traditional Moroccan riad like Esprit du Maroc for a unique experience unlike any other. We want to thank Sylvie, our wonderful host at Esprit du Maroc for the warm hospitality.